Latin name: Hyalopsora aspidiotus (Magn.) Magn. True fir rusts may cause growth deformation (brooms), or defoliation (premature needle drop), or both. As a result, wood volume and quality may be reduced, and trees are occasionally top-killed. However, the economic impact of these diseases has been insignificant, even though severe outbreaks of several of these diseases have occurred. The major threat is probably in forest nurseries, where there are high densities of susceptible host trees and where there tends to be high humidity, which favours the development of needle and broom rusts. Identification of rusts on true firs is very difficult. Some species cannot be identified except when found on their alternate host. Consultation with a specialist is recommended. 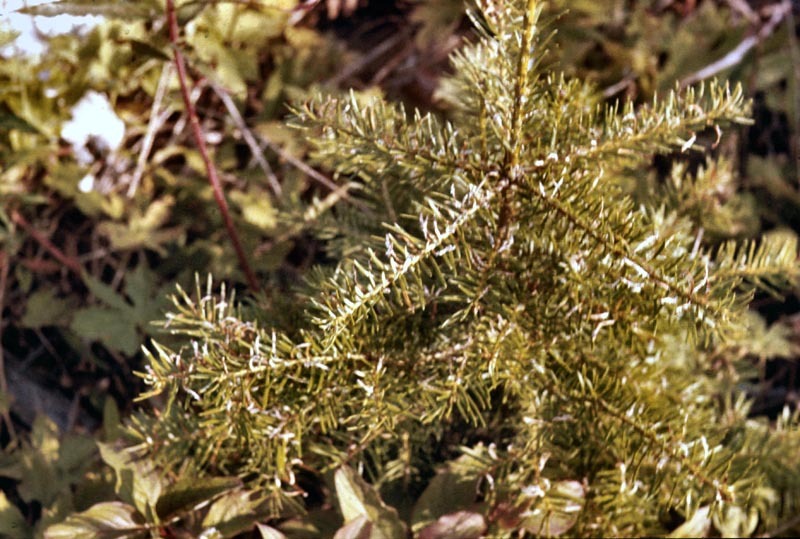 Thin foliage on the lower branches of fir trees may indicate past infections. However, this symptom is not reliable because the cause could be another disease agent or insect attack. Also, in the case of fir-broom rust, the brooms resulting from infection may be confused with those caused by other organisms. The rusts are unique among the parasitic fungi in that most require two unrelated host plants on which to complete their complex life cycle. Normally, rusts pass through five reproductive states during the course of the cycle. The first two – pycnial and aecial - occur on the primary host. The others - uredinial, telial and basidial - occur on the secondary (alternate) host. Each state produces a specific type of spore (microscopic reproductive structure that functions like a seed). 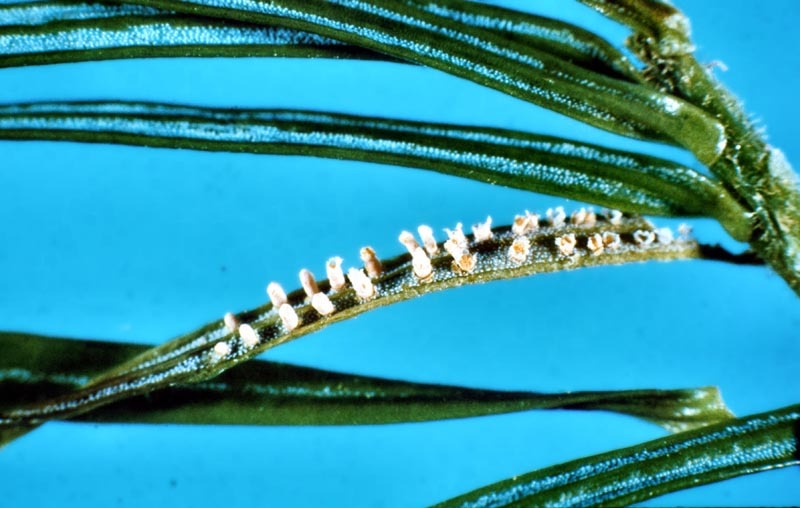 Needle rusts are most commonly seen on young trees and on the younger branches of older trees. Once known, most signs and symptoms of these diseases on the secondary host plants are readily discernable. Knowledge of the life cycles of the seven most common rusts will be useful in identification. However, annual weather fluctuations and geographical location (e.g. elevation) will influence timing and intensity of the visible features of these rusts. Generally, the rusts are widely distributed throughout the northern hemisphere. Their incidence and importance vary from area to area and from year to year. While all native true firs are susceptible, some host species are infected more often than others. Because of their widespread distribution and their capacity for infecting true firs, foliage rusts have the potential to cause a lot of damage; fortunately, due to their complex life cycle, this threat is seldom realized. 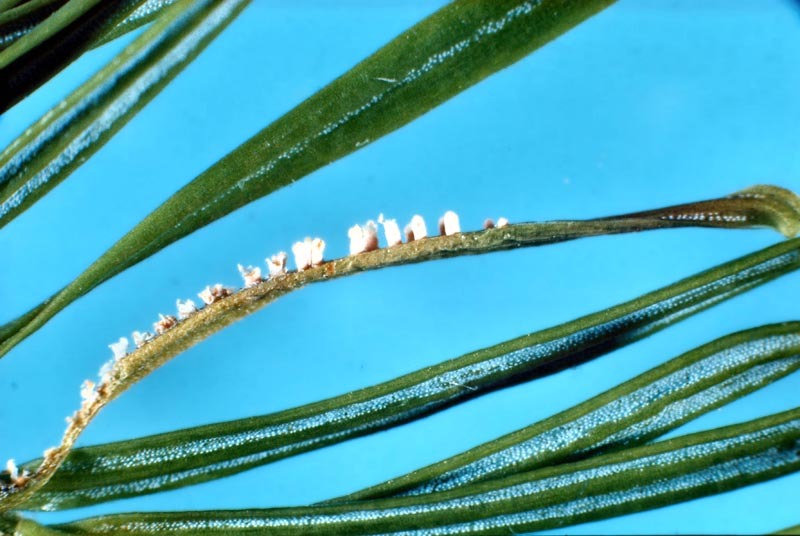 Fir rust fungi alternate between primary hosts (fir trees) and secondary hosts (non-coniferous plants) in their complicated life cycle. This rust occurs on all native true firs: alpine fir, amabilis fir and grand fir.